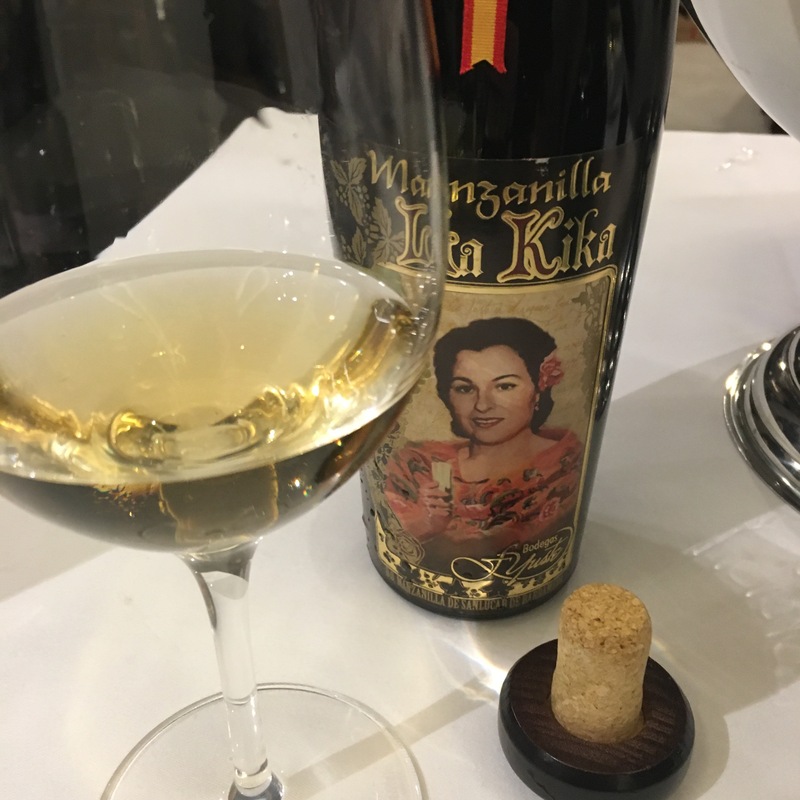 This was new to me when I tried it yesterday at the Feria de Vinos organized by Lavinia and is a very attractive manzanilla from Bodegas Yuste. La Kika (pictured on the label) is or was the mother of the owner of bodega and the grandmother of the young lad who served it to me and the wine and everything about it is apparently a homage to her. In the circumstances, I feel a bit of a curmudgeon for complaining, but this is yet another case of a unique bottle shape that plays havoc with a fella’s storage arrangements (you can see why better on the ficha). In fact the bottle is an Italian olive oil bottle – even has a small lip – and just look at the cahoba stopper on that cork. As it happens I don’t have any bottles of this but if I did I don’t know where I would put them. Anyway, the more important thing here is the wine in the bottle. This is a manzanilla (from palomino all sourced in Balbaina – or at least is now all sourced in Balbaina) that has passed through nine classes located in three different bodegas – the first three in Miraflores, then three in Los Angeles, then the last three in Santa Ana. At the end the average age under flor is about 10 years. It is apparently unfiltered and bottled by hand – real artisanship. The colour is a nice rich gold – a touch of brown gives a hint of its age. On the nose first up it is creamy and I detected Jura-like cheese aromas, seaside aromas like a puerto fino, yeasty green grass and unsalted almonds. Then similar richness on the palate – creamy texture and buttery flavour at first, then really punchy yeastiness and a long slightly bitter, nutty, mineral finish: really zingy and fresh, almost drying. Really good, expressive and full of character. A fitting tribute to anyone’s grandmother.